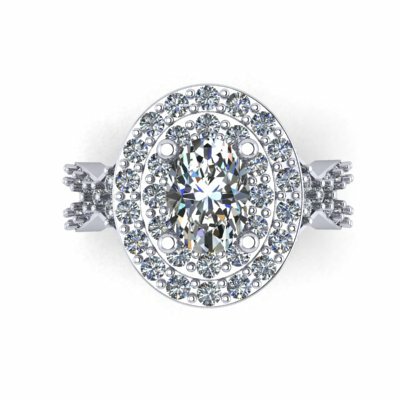 Here at Omori Diamonds, we create fine custom jewelry including exceptional diamond and sapphire rings. 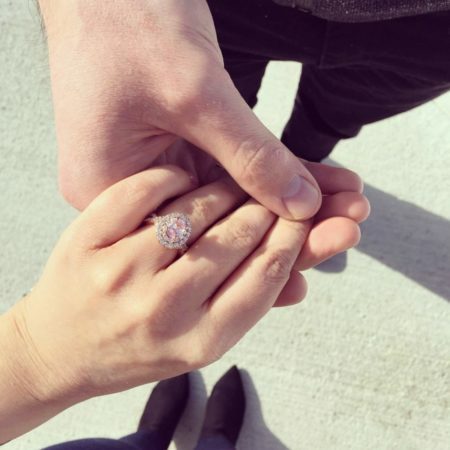 In today’s article we will be showing you a wonderful pink sapphire engagement ring that we created for a special couple. By now you have probably noticed that crafting beautiful sapphire engagement rings is one of our main specialties. Ceylon sapphires make for the perfect choice for a unique non-diamond engagement ring due to their durability and hardness. Did you know that sapphires score a 9 on the Mohs scale of hardness, right next to diamonds which score a solid 10? This means that sapphires will wear very well over time and are a great choice for any piece of jewelry that you plan to wear for many years. Sapphires are also a common feature in many celebrity engagement rings especially those worn by many of the Royal families. Be sure to have a look at Kate Middleton’s famous sapphire ring, who’s stone was previously worn by lady Diana. To learn more about sapphires visit our article: Sapphires, The Birthstone For September! More in depth sapphire info can also be found at the GIA website. The design we would like to show you today features an absolutely beautiful pink ceylon sapphire and was created for a special couple who is close to our hearts. 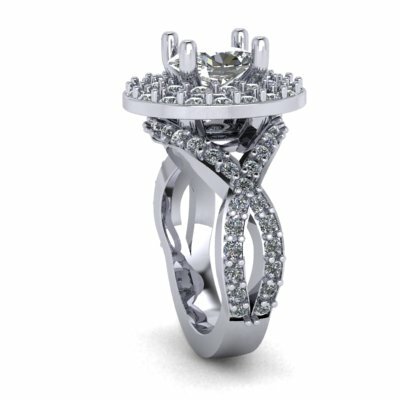 This ring features a double halo of diamonds as well as an elegant infinity band. 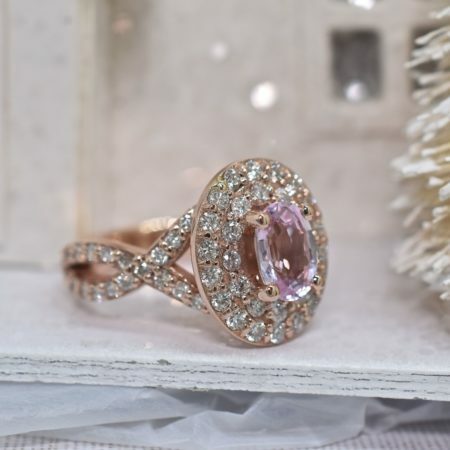 During the creation of the pink sapphire ring we began by discussing design ideas with out clients and helping them to select their perfect stone. As is often the case, after discussing the details of the design, we began by creating some CAD images (computer aided design). This is done so that we can show our client’s a visual representation of their design and allow them to suggest any changes that they would like to see. As you can see from the images below, the CAD images give quite an accurate representation of the finished design.Please note the computer images show the centre stone as a diamond and not as a pink sapphire. After showing our client’s the CAD images of their custom engagement ring, the next step was to create a wax model of the ring. This provides a more in depth look at the finished ring and allows for further suggestions or changes to the design. Once we were given the OK, the ring was cast in rose gold. At this point our master goldsmith polished the design and set both the diamonds and sapphire at which point we called our client to come and pick up the ring! We are very proud and pleased to say that the both of them loved their ring and that their engagement went great! 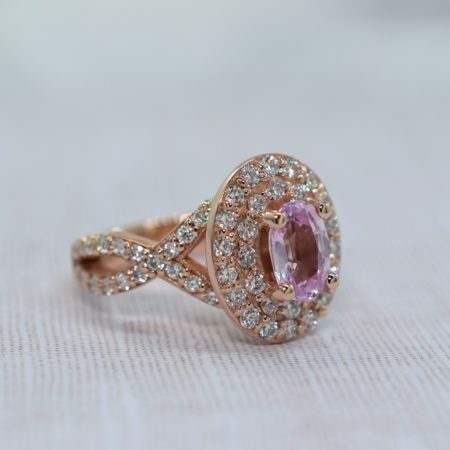 Thank you for checking out this article on this custom pink sapphire engagement ring created by Omori Diamonds. We hope you have enjoyed learning about the custom jewelry design process and about this special design. Feel free to browse our engagement rings and wedding bands pages as well as our loose diamonds page. 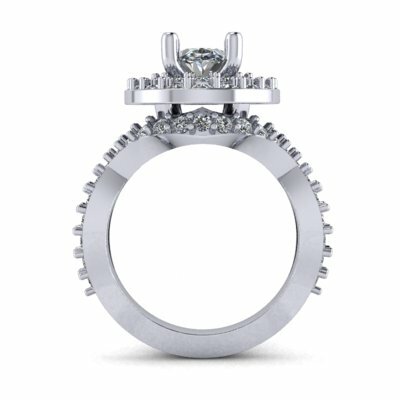 When the time comes to create your own custom engagement ring don’t hesitate to get in touch! Until then, follow us on facebook, twitter or instagram!